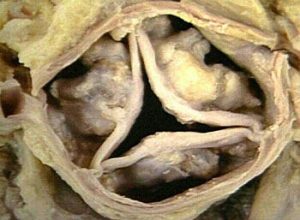 Heart valves open and close to allow the blood to flow in and out of the four chambers of the heart in the right direction. If they are damaged (through infection or disease) they will either not open properly or not close tightly enough and leak. Both problems mean the heart has to pump harder. A new aortic valve relieves the strain on the heart and aims to ease symptoms such as breathlessness and chest pain. the changes in heart rhythm. 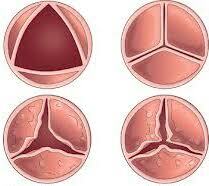 All patients with heart valve disease are assigned to one of the new 4-stage. The reasons for valvular intervention include to improve symptoms, to prolong survival, and to reduce the risk of complications. The operation involves replacing a damaged valve in your heart with a mechanical valve (made from man-made materials) or a tissue valve (usually from a cow or pig). requires a hospital stay of 5-7 seven days and is done under general anaesthesia. This means you will be asleep during the procedure. Once the anaesthetic has taken effect, your surgeon will make a cut (traditionally about 25cm long, mini sternotomy about 10-12cm long), down the middle of your breastbone and open the ribcage to reach the heart. The heart is slowed or stopped (using medication) and blood is re-routed to a heart-lung machine. This takes over the pumping action of the heart and lungs, adding oxygen to the blood and maintaining the circulation. Your surgeon will open the heart chamber, remove the faulty valve and sew in a replacement. Blood is then redirected back to your heart and the heart is restarted. The breastbone is re-joined using wires and your chest is closed using dissolvable sutures, stitches or staples. The operation usually takes about 2-3 hours. 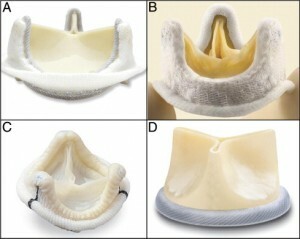 There are a variety of biological valves which can be used for aortic valve replacement. Most are made from cow or pig tissue. The main advantage of this type of valve is that it is associated with a low risk of blood clot formation which if occurs, can cause the valve to malfunction or cause a stroke. The main disadvantage is that these valves have a limited durability as compared with mechanical valves. In other words, they will wear out given enough time. The rate at which they wear out depends on the patient’s age. A young boy might wear out a valve in only a few years, while the same valve might last 10-15 years in middle aged person, and even longer in a patient over the age of 70. Of course, as we grow older we expect that we will not need the valve for as many years as our life expectancy is less. The general consensus is that a tissue valve is best used in patients from the age of 55-70 years. There are a number of excellent mechanical prostheses available today. All perform equally well. The principle advantage of mechanical valves is their excellent durability, made from carbonised metal they simply do not wear out! Their main disadvantage is that blood cells are likely to form clots on the surface of the metal. If this happens the valve will not function normally. Patients with these valves must therefore take anticoagulants (blood thinners) for life. There is also a small but definite risk of blood clots causing stroke, even when taking anticoagulants. Aortic valve repair is a new way of treating dysfunctional aortic valves. Not all leaking aortic valves are amenable to aortic valve repair and not all cardiac surgeons are capable in performing this type of operations. It is recommended that aortic valve repairs are performed by sub-specialist aortic surgeons with specialist interest in the field. 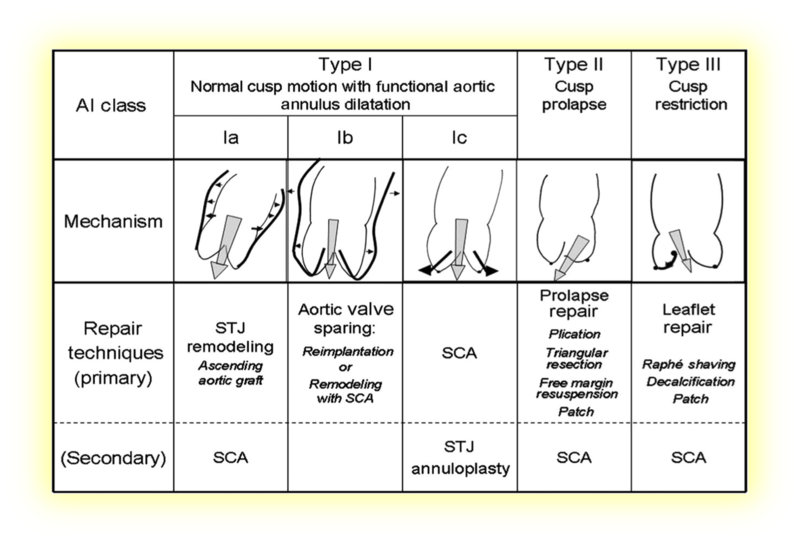 Tricuspid aortic valve (the aortic valve has three doors, normal configuration) that present with aortic regurgitation (leaking valves) can be treated using a number of different type of techniques with very good record of success and excellent functional end-result. Aortic valve repair can also be deployed into young patients with congenitally abnormal aortic valve (defects you are born with) like the bicuspid aortic valve (the aortic valve has two doors). The aortic valve repair of those valves can offer to the patient a functionally competent valve with excellent haemodynamics and postpone the replacement therapy into the future. 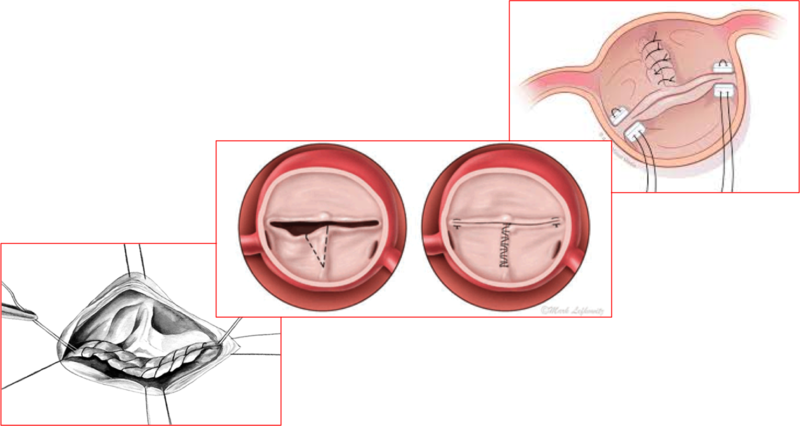 Commissurotomy, which is used for narrowed valves, where the cusps (the leaflets that make up the valve) are thickened and perhaps stuck together. The surgeon opens the valve by cutting the points where the cusps meet. 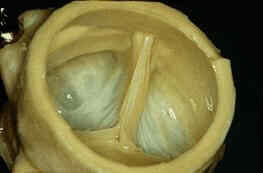 Valvuloplasty, which strengthens the cusps to provide more support and to let the valve close tightly. Reshaping, where the surgeon cuts out a section of a cusp. 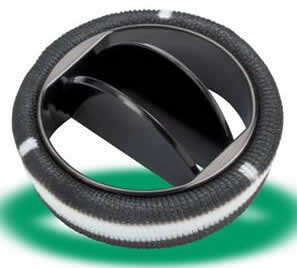 Once the cusp is sewn back together, the valve can close properly. Decalcification, removes calcium which has built up on the cusps. Once the calcium is removed, the cusps can close properly. Patching, where the surgeon covers holes or tears in the cusps with a tissue patch. This minimally invasive surgical procedure treats the malfunctioning valve and alleviates the symptoms without removing the old, damaged, native aortic valve. Instead, it wedges the new valve inside the old, diseased valve, which has been previously stretched open. The surgery may be called a transcatheter aortic valve replacement (TAVR) or transcatheter aortic valve implantation (TAVI). These techniques are reserved for patients who are well over 70 years of age (usually in their 80s & 90s) and who either cannot have or who carry a very high risk of death from formal cardiac surgery. As a TAVI is still a new procedure, its long-term benefits are not known. At present, if you need to have an aortic valve replacement, it is more likely that you will be offered a conventional heart valve surgery. The Oxford TAVI Team have been working together since the inception of the technology in 2009 and is delivering hundreds of TAVI operations per year. Every case that is refereed for TAVI is discussed at our sub-specialised TAVI multidisciplinary team and the treatment options are individualized and optimized to meet the needs of each and every patient we treat. 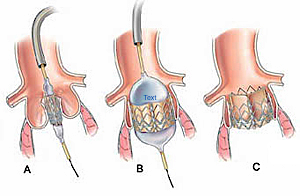 When transcatheter aortic valve implantation (TAVI) is performed transfemorally, via the groin , a local anesthetic is used to numb the area around the artery in order to insert a special catheter. Once inside the artery, the catheter is advanced from the groin to the aortic valve of the heart. This catheter carries an expanding valve armed with a specially designed balloon. After the new valve is implanted within the existing (native) valve, the patient returns to a high dependency area for observation. The patient usually leaves the hospital within 2-3 days after surgery. 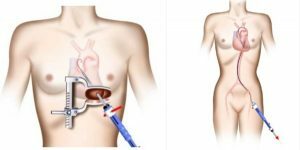 When we are replacing the aortic valve through a small incision in the chest – transapically or transaortic, a general anesthetic is given to the patient. After a small incision has been made to the left side of the chest, a special catheter is advanced from the apex of the heart to the aortic valve. This catheter carries an expanding valve armed onto a special balloon. 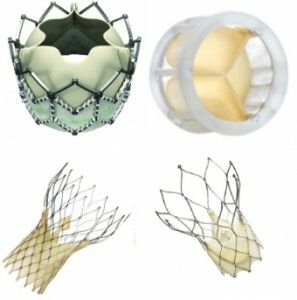 After the new valve is implanted within the native valve, the patient returns to a high dependency area for observation. The patient usually leaves the hospital within 3-5 days after surgery. 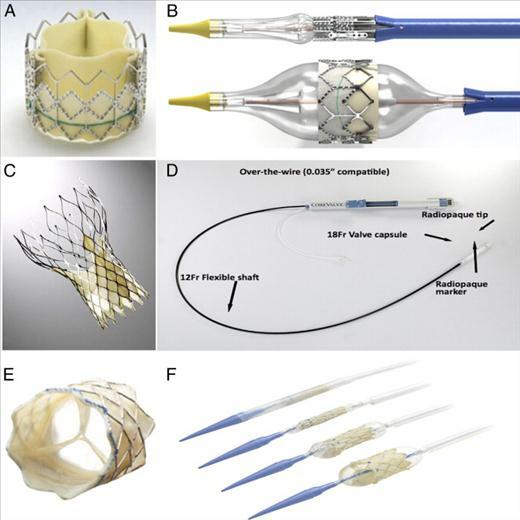 Transfemoral Transcatheter Aortic Valve-in-Valve Implantation for Aortic Valve Bioprosthesis Failure With the Fully Repositionable and Retrievable Lotus Valve: A Single-Center Experience. Ruparelia N, Thomas K, Newton JD, Grebenik K, Keiralla A, Krasopoulos G, Sayeed R, Banning AP, Kharbanda RK. J Invasive Cardiol. 2017 Jul 15. pii: JIC2017715-2. European real world trans-catheter aortic valve implantation: systematic review and meta-analysis of European national registries. Krasopoulos G, Falconieri F, Benedetto U, Newton J, Sayeed R, Kharbanda R, Banning A. J Cardiothorac Surg. 2016 Nov 29;11(1):159. Review. Very long-term survival implications of heart valve replacement with tissue versus mechanical prostheses in adults <60 years of age. Ruel M, Chan V, B&eacutedard P, Kulik A, Ressler L, Lam BK, Rubens FD, Goldstein W, Hendry PJ, Masters RG, Mesana TG. Circulation. 2007 Sep 11;116(11 Suppl):I294-300. Valve replacement in octogenarians: arguments for an earlier surgical intervention. Piper C, Hering D, Kleikamp G, Körfer R, Horstkotte D. J Heart Valve Dis. 2009 May;18(3):239-44. Transesophageal echocardiographic evaluation during aortic valve repair surgery. Van Dyck MJ, Watremez C, Boodhwani M, Vanoverschelde JL, El Khoury G. Anesth Analg. 2010 Jul;111(1):59-70. Epub 2010 Jun 3. Review. Cusp prolapse repair in trileaflet aortic valves: free margin plication and free margin resuspension techniques. de Kerchove L, Boodhwani M, Glineur D, Poncelet A, Rubay J, Watremez C, Vanoverschelde JL, Noirhomme P, El Khoury G. Ann Thorac Surg. 2009 Aug;88(2):455-61; discussion 461. 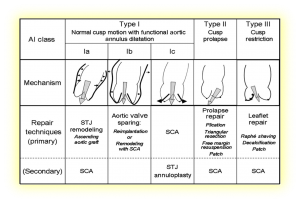 Repair-oriented classification of aortic insufficiency: impact on surgical techniques and clinical outcomes. Boodhwani M, de Kerchove L, Glineur D, Poncelet A, Rubay J, Astarci P, Verhelst R, Noirhomme P, El Khoury G. J Thorac Cardiovasc Surg. 2009 Feb;137(2):286-94. Epub 2008 Dec 27. Repair of aortic leaflet prolapse: a ten-year experience. de Kerchove L, Glineur D, Poncelet A, Boodhwani M, Rubay J, Dhoore W, Noirhomme P, El Khoury G. Eur J Cardiothorac Surg. 2008 Oct;34(4):785-91.